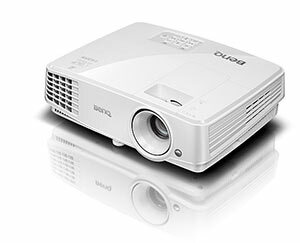 Device maker BenQ has added a new model to its Colorific line of projectors intended for education environments. The MX570 retails for $529 and includes features for audio, remote support and energy management. The Colorific line emphasizes billion-color accuracy and high contrast for image crispness. To reduce energy consumption, the MX570 includes an "eco blank mode" that allows the user to blank the screen when projection isn't needed. A "no source detected" mode automatically reduces brightness by 30 percent when no display has been detected for more than three minutes; after 30 minutes of inactivity, the projector automatically shuts down to save power. "The MX570 is BenQ's statement that affordability does not have to mean low quality," said BenQ Marketing Manager Felix Pimentel. "The projector is lighter, brighter, offers more connectivity options, lasts longer and provides more value than other solutions in its class. With features such as SmartEco technology and remote LAN management, the MX570 is a simple and efficient solution for small- to medium-size spaces."